Jo’s Monday walk : A walk through a Pub! If there’s anything that really annoys me it’s leaving home in clear blue skies to drive to the Yorkshire Dales and encounter grey, dampness. But if you’re in search of a waterfall then you can’t really begrudge a little rain. And to visit Hardraw Force you have to pass through a pub, so you might say there are compensations. I don’t know the village of Hawes at all but it is surrounded by magnificent, sweeping countryside, though visibility was poor on this particular day. 850 feet above sea level, it claims to be England’s highest, and has been home to a market since 1307. Go on a Tuesday if you’re a market fan. The name Hawes means ‘a pass between mountains’, in this case endearingly-named Buttertubs and Fleet Moss. I’m heading for Hardraw but, on Town Head, a sign for Gayle’s Mill strikes a chord with me. In 2004 it was a finalist on the BBC TV ‘Restoration’ programme. It was but a short diversion to take a look. Unfortunately this was as close as I could get. Gayle Mill is a working saw mill, and can only be visited by guided tour. Even the craft shop was closed. The Wensleydale Creamery Visitor Centre, a highly popular venue, is nearby and I gave it a wistful look. I do love a good bit of cheese. 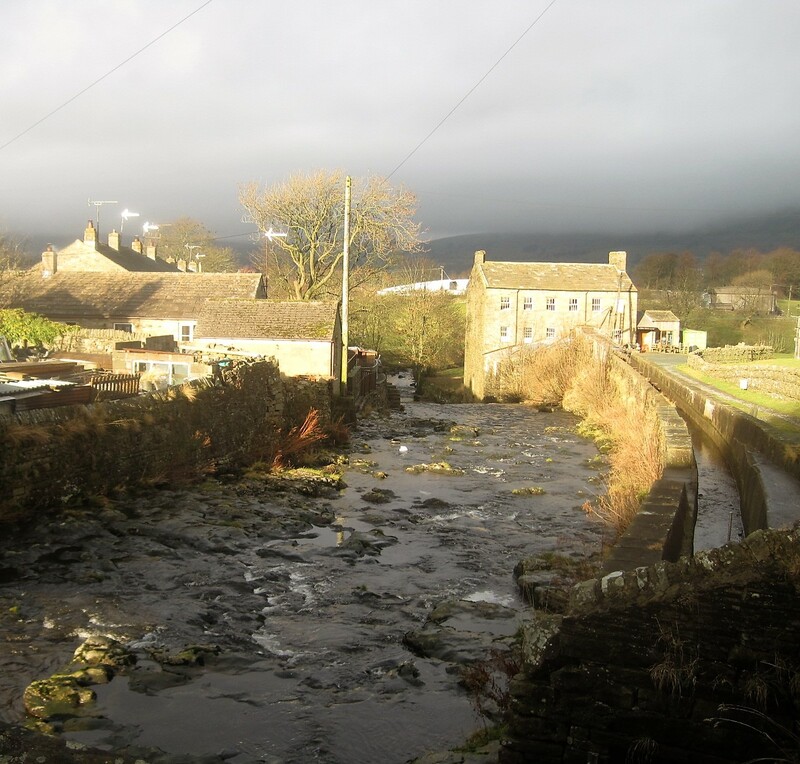 Water flows through the village and is harnessed by the mill, which dates from 1784. In the 1900s it pioneered electricity generation and brought light to the valley. Just then the sky was darkening rapidly and it seemed like a good time to move on. You could retrace your steps down Gayle Lane, but a pretty little footpath offers an alternative route back to Town Foot. And sheep! Hardraw Force is clearly signed from the crossroads, so it was best foot forwards into a chilly breeze. I told myself it was holding off the rain. There’s often a wind off the water, isn’t there? I turned left into the field and trod carefully till I reached the flagstones. It’s not far till you pass through a gate and the pub is right there, in front of you. The sign says ‘innkeeper and waterfall provider’. That’s quite a claim, isn’t it? At £2.50 a person, is it a little mercenary? Let’s see if it delivers. One of the best sounds for me is rushing water. Rounding the corner from the Green Dragon Inn, I can already hear the tumult of the falls. England’s highest single drop waterfall sits in a great bowl of limestone, shale and sandstone. Incredible to think that the process that produced this landscape began some 340 million years ago. Alternating layers were laid down in the warm seas of those times, and through the rise and fall of the land and some glacial activity the Karst scenery developed. At the back of the waterfall it’s possible to see the individual layers. Did you wave back? I did! And then I crossed over the bridge and followed the path back along the opposite bank. It was really busy in the Green Dragon Inn, so I didn’t linger, though it did look characterful. I was surprised at how many people had ventured out on such a grey day, and can only surmise that this will be a seriously busy place in summer. But the waterfall will be much diminished. I just about made it back before the rain hit. The waterfall will be thundering for a few days yet. Hawes lies along the A684 from Leyburn in the Yorkshire Dales. The map on this link will give you a few clues. Time to get the kettle on! Thanks everybody for kindly accompanying me each week, come hail come shine (but hopefully no snow!). It’s always a pleasure to have you along. I have some more great contributions this week. Please spare a little time to go visit, especially if they’re new to you. Details, as usual, are on my Jo’s Monday walk page. I’d love you to join me with a walk of your own. Lady Lee is always a few steps ahead of me! Have you been to Dresden? Jackie and glitz go together, don’t you think? In pure contrast, I never saw snow look more beautiful! Thanks so much, Drake! This week we have a Wild Daffodil joining us. Sound like fun? Do go and say hello! And Inese shows us drama in Ireland, rain, shine and rainbow! That’s it for another week. It’s been a grey one here but I’m sure Spring is on its way. Enjoy your life, won’t you, whatever the weather?